Sometimes, it feels like LEGO is all about the remakes, but when you take a step back from the rabid fan base ledge (a locale that I keep an apartment at), it’s the kind of thing that makes sense in a licensed theme like Star Wars. The reality is that there is a finite amount of things they can make, and even when there are certain ships or vehicles that get the short stick, the reality is that the majority of their customers, kids, never had a chance to own the earlier version of a particular set or ship. Unless it’s a Jedi Starfighter, since it feels like they release ten of them a year. And no matter how we old farts feel about the PT, younger audiences, and, honestly, even adults that are in their 20s by now, identify with those movies just as much as we identify with the original movies. I have a (somewhat notorious) history of ripping on Episode I in some of my reviews, because that movie just stunk out loud, but one thing you can really say about it, much more than II or III, is that the vehicles that came from it were quite a bit more memorable than some of the later stuff. The AAT, Pod Racers, Naboo Fighters, Vulture Droids, and the Gungan Sub were all visually distinct and interesting vehicles. Yet none of those sets ever got me quite as much as the MTT (Multi-Troop Transport, though since it carried droids, maybe it was a Multi-Toaster Transport). Part of that is because it was one of the most notable parts of the trailer that built up all the excitement going in to Episode I (before those hopes were just destroyed)… the doors opening, droids going down, and the sound of them standing up was shudder-worthy back in the day. 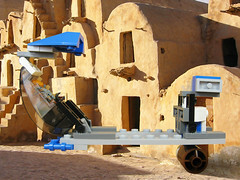 Yet more than that, 2007’s 7662 Trade Federation MTT of this particular vehicle was just a fantastic build. 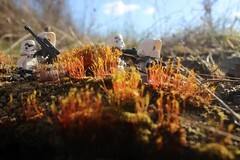 It was itself a remake of the original 1999 set, and LEGO came a lot way between that official wave and the middle of the 00s, and it delivered some serious bang at $99 by delivering 1330 parts (including a mess of brown slopes) and 21 Battle Droids. I actually own a few of the 2007 version after stumbling on a great clearance sale, and it’s one of the sets that I keep perpetually built and sitting on a shelf. 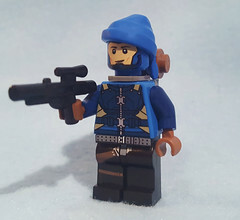 It was going to be hard for LEGO to actually top that build, but they’ve been able to surprise me before on some remakes. The chances of that took a pretty huge hit when the first images of this set, and the pricing details, first surfaced. It was a TRU exclusive, which meant it likely had the TRU markup (though right now it’s SRP on their website… YMMV in stores). The price was $10 less, which is actually a bigger gap when you look at general inflation of LEGO price points ($89 now is basically the $69 price point then… while that $99 in 2007 is a $130 set now), but worse, when you looked at the set, it just looked all sorts of wrong. Small, ugly, and seemingly a step back, the set was going to have the deck stacked against it for anyone who owned (and loved) the previous version. I wanted to give this set the benefit of the doubt… honest; LEGO has changed a lot over the years, and they’ve been able to do more with less parts before. There have been some really good models that have a part count you wouldn’t normally think could make a set as well as it does. Yet this thing is just awful, probably one of the worst remakes LEGO has ever done. I didn’t like Jabba’s Sail Barge because it was a pretty big diversion from the original and it shoved in a bunch of pointless play features… but it can’t hold a candle to this rolling dumpster fire of a set. Okay, perspective got a bit wonky, since I basically just placed both of the sets at the back of my lightbox and took the picture. It makes the original look ridiculously huge next to the new one, and it’s not triple the size… it’s only like double. You can also see some dust on the old set, because this isn’t a set I had to dig out and build to take pictures of, because it was already sitting on my shelf. Of course, if I put the old set closer and take the picture… it still loses out on the size.The original dwarfs this thing. You can’t escape it while you’re building the whole set. There are two distinct groups of minifigs, because at some point in the recent past, someone at LEGO decided that it’s not a LEGO set unless there are some minifigs in the set. We get three minifigs that make less sense than it seems like on first blush. While Qui-Gon, briefly, was seen running from an MTT in the swamp when they first landed on Naboo, Obi-Wan was there to just blow up a STAP (which is included in this set… more on that later). The Naboo Guard who is not Captain Pancake Panaka (when I was doing a Google search, it’s suggestion was Captain Pancake instead of Panaka… and that is awesome) wasn’t in the scene with Obi-Wan and Qui-Gon running through the jungle… in fact, the Naboo military never fought the MTTs in the big battle, the Gungans did. Maybe there were MTTs parked in the hangers around Theed, where the troops were being held prisoner, but it’s not the kind of detail that stood out. I never thought I’d say this… but this set needs Jar-Jar (as well as some of the other Gungans) if you want it to make sense. 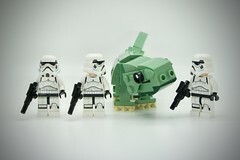 LEGO could have satisfied their “must have minis” rule and even included a main character in the set by using Gungans instead of these guys. While I hate Jar-Jar as a character, I actually quite like Gungan minis, and the Battle of Naboo from a few years back was a stellar little set. Qui-Gon is the latest in a long trend of adding too much detail. While I’m much more middle-road on increasing detail on these figures, I vastly prefer the original fleshy Qui-Gon, because the eyebrows, eyes, and beard just look more like Liam Neeson on that figure. The latest version, on the right, is pretty much the same as more recent version, except the lines are a bit thicker (the middle two have subtle differences on tunic printing and the eyes), and he now has printed legs. Qui-Gon has actually only been in four sets in Fleshy form, all as a unique one-off… not bad for a guy who basically broke the rules of the Jedi order and brought about the eventual murder of children and all of his peers. That’s the same amount of times that Padme has been in a set in fleshy variety (despite being in all of the films). His padawan, the young continuer of mistakes, Obi-Wan, shows up in the set as well. Like Qui-Gon, he gets more lines in his printing and everything becomes sharper. This version is more or less the same as the Gungan Sub figure (like Qui-Gon), but with printed legs and a slightly different belt. The alt face is all angry, which is fitting, since the Jedi are well known for their anger problems. It still has the problem that the alternate face printing pokes out under his hair, but otherwise, there’s little more to be said about the figure that hasn’t been said before. The last true minifig is the Naboo Security guard, who is much more welcome in the set despite not making sense. It’s always nice to get a person of color or some variety in the minifig heads out there, and this guy has a lot of promise. The printing is kind of basic compared to the others, and that bottom part comes off looking more like a loin-cloth than anything else (and I’m sure someone is going to use it for that purpose, probably with a yellow Slave Leia top). Not Captain Pancake makes this set, but does look surprisingly like him, just with a less-dumb hat and a more-dumb uniform. The head is slightly different, with that face, and has gloved hands, but I welcome the variety in the set. This is the figure I’d love to see more of… just a shame it’s in such an expensive, and sub-par, set, and only comes with a single figure. Probably going to command a pretty high aftermarket price. There are also a whole bunch of Battle Droids in the set. Sure, it’s less than the 21 in the 2007 version, but not an insignficant amount at six with a gun-holding arm, one with clip arms (for the STAP), and a pilot. There’s also a white… droid, of some sort, called PK-4 by Bricklink that was in some deleted scenes, but apparently too insignificant to even get mentioning in the product details on [email protected] LEGO doesn’t consider the droids minifigs, so the set comes with three. 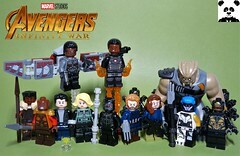 Normal people would call them minifigs, which means the set comes with 13 figures. Now, back to the vehicle. The MTT is an interesting idea, though it seems pretty inefficient to build a vehicle that’s designed to take inactive droids to a battlefield. Seems like you’d just build a bit bigger droid capable of delivering itself, but I suppose that’s less fun. In the movie, these things carry a whole bunch of droids (112 according to Wookiepedia), and was basically a tank once the droids were down, thanks to those guns at the front. Obviously, LEGO can’t squish and stack 112 battle droids into this little toy, and I don’t want to pay for a set that would have that many (can you imagine how many requests you’d have to make just for broken arm clips?). Yet, somehow, six seems so paltry that it’s more like an add-on than the whole purpose that the vehicle exists. This is where the “it’s all smaller” really bites this thing. Worse, how the droid are stored is just wrong. Episode I had the whole long scene where it showed the droids all folded up and inactive, expanding out to a massive army bent on making Gungan mash. The old version I thought did a really good job with the space, actually using the structure of the battle droid to be folded up and separated out. Sure, it didn’t take up as much space as one would have hoped, but it still looked like the whole point of the vehicle. I will say the one thing that the newer version does well is the look around the front and the back of the rack, using rounded parts instead of basically just giving up with slopes. That being said, that part is very fragile, and they broke off several times when I was setting up pictures and opening the door. The front of the ship just feels a bit off, for some reason, and I think it’s mostly due to the size. More than that, though, it’s just how bad the build looks in matching up different pieces. See all that gap around the lower door… that’s how the thing is set up. It feels like there’s something missing, but there are far worse parts on the ship. Like, say that gap there. I’m not sure if there’s ever been an uglier gap in a LEGO set. This is worse than the bottom of the most recent version of the Falcon, worse than the missing part of the Cars 2 plane, and worse than the fact that the last Sith Infiltrator was basically just a hood. My picture doesn’t do the awfulness of the thing justice… it’s ten times worse than it looks there. There are so many exposed parts like that in the build. Behind the dish there’s the gap for the hinge on that top dish. There’s the gap under the slide-out doors, or the large plates and jarring color choices on the back. Even if I didn’t own the last set, this thing would be bad for these features alone… it’s not just small, it’s ugly and it’s a terrible, lazy build. The whole set has all kinds of “play features” hidden in the set, because I guess having a big tank that delivers murder bots to a battle field isn’t enough. We need a gun stand, inconveniently located around the side of the ship. Outside of Jar-Jar, the Gungans seemed to have some pretty solid tactical minds, and I’m thinking they’d take a few shots at the unarmed droids that are scurrying to the back of the tank to go pick up their guns. Not to mention that opening up the side basically negates the armor, so you can take a few pot-shots at the interior of a tank. Anyone who’s a buff on modern military armor knows that getting fire inside a tank has turned said tank into a very heavy coffin. Or whatever it is you bury a robot in. The old one did have a compartment in the back as well, but it put a speeder in the thing, so it’s openings were to deliver more robot killing machines at a faster pace. It also opened out the back so it was protected by the tank itself. Oh, and that STAP on the back is basically the entire back section that flips open to deliver it. Probably thirty extra parts are put into that section just so it can hold the STAP on its transparent dish used to stand it up. All of the sections that open up also hold little removable plates that hold the extra stuff. The underside also has one of the weirdest uses of parts that I’ve ever seen in a LEGO build. See all those red pins there? You put them in to basically keep the wheels from falling off, because instead of giving us a real wheel and axle, we have transparent gears that just sit on the pin. I suppose it’s an ingenious fix to a problem, but it’s a problem that smacks of bad design more than an engineering challenge. We get a new build for the STAP in this model, which I think makes the 800th version of this little vehicle. I actually like the STAP, and have enjoyed the previous version which had been consistent for some time. This version apparently felt that the previous versions were a bit too thin, and packed on the pounds in the middle. Compare it to the STAPs from the Battle on Saleucami set made earlier in 2014, and you’ll see the added width. It’s not a bad build, per se, just one I didn’t think needed to change. It’s also the part that makes sense with Obi-Wan and Qui-Gon around (unlike everything else in the set). Sure, in the start, I also explained why LEGO makes remakes… the original set is almost eight years old at this point, and the majority of their customers aren’t going to own that old one. But that’s not an excuse for making such a sub-par set with the remake. This is only $10 less than the old set (or 30ish, if you want to adjust for inflation), but it’s inferior in almost every way. Fewer droids, fewer pieces, it’s smaller, and it’s uglier. It adds minifigs that have no reason to be in the set and it adds play features that don’t need to be there either. The MTT is basically a big troop transport, and that should be the focus of the play. Instead, it’s got all these flip open parts and hidden compartments that aren’t part of the vehicle (or the movie). It’s a frustrating trend in LEGO, trying to put more and more play features into sets that are supposed to represent something. If this was just a regular, original theme set, then play features can go all over the place. But it’s supposed to be an MTT, and it fails at that. Play features should add to a set, no subtract from it, and that’s exactly what they do here. Maybe I’m too far removed from my childhood, but I know when I got a toy from a movie or TV show I wanted it to be, more than anything, like what I saw in the movie or show. This doesn’t do that, and it’s not only worse than the 2007 version, it’s worse than the original 1999 version as well. LEGO could have done so much more with this set. Increase the price to give it the piece count it deserved, and you get a better set. Include Gungans to fight the thing instead of two Jedi, and give them some stuff instead of the pointless play features, and you get a better set. Maybe spend a few minutes covering up all of the ugly gaps and lazy building, and you get a better set. There was so much potential here, and apparently LEGO didn’t go for any of it. Say what you want about Episode I for quality (and I most certainly have), it did give us plenty of good things to build and work with. There are a lot of sets that are more deserving of your $90 than this thing is. The original isn’t horribly marked up on the aftermarket if you really want an MTT, or I would suggest you just go build your own. 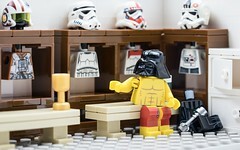 There’s no way you can do worse than LEGO did here, and you’re pretty much guaranteed to do a vastly better job. An even bigger knock on this set is that you’re better off going to the aftermarket for parts… you’d need to buy two of these to make a decently sized MTT (and wouldn’t have enough slopes to make it look right anyway). This thing is a two out of five only because I’m giving an extra point for including the Naboo Security Guard. You can pick up this set, all of the 2014 and the newly-released 2015 sets, at Lego [email protected], right now!